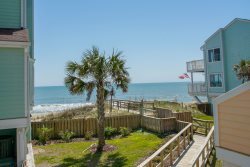 Consider renting this recently updated, fully furnished 2 bedroom 2 bathroom condo at Carolina Beach with great ocean views from the top floor and access to 2 swimming pools. This vacation rental is located directly across the street from the beach and has 2 amazing decks with great water views. This unit offers a washer and a dryer in the unit, fully updated kitchen and wood floors throughout. The master bedroom is beautifully decorated and has a queen sized bed. The second bedroom has two single beds. There is a pull out sofa in the living room. You can walk to the Carolina Beach pier to fish, enjoy a drink / snack, or just enjoy the great views. The pier also has a restaurant and bar. Freeman park, which is 4 wheel drive beach access is located just a few blocks north. This property is fully furnished and ready for your enjoyment today. There are two outdoor Swimming Pools available for your use while staying at Summer Salt. One is two buildings down. Very helpful. Answered phone calls and texts quickly! A clean property with nice views. Close to Carolina Beach Boardwalk, but far enough away that it is quiet and safe. Cozy bedrooms and living room. Nice kitchen and the unit had a washer and dryer, which was useful! The AC went out and was fixed immediately. Was gratful for the prompt attention and felt that they cared about our comfort while staying there. The condo was exactly what we had hoped for. Thank you for your help in making our vacation wonderful. Great location, well appointed, beach is gorgeous! This property does not allow pets of any kind. We are also a smoke free property, so no smoking.